If you like polenta and its many variations, you will find grilled polenta crostini is a master recipe for countless appetizers and a base for hundreds of toppings. It is an ideal finger food and it will stand up to whatever topping you and your family enjoy. . . . like our Baccala Mantecato alla Veneziana. For generations polenta was considered a peasant food and it was only later in life that I truly appreciated its taste and the effort it took to make it. I remember complaining whenever mamma would make polenta. I didn’t complain because of the taste . . . .
. . . . no I complained because it was such hard work for her. She was barely five feet tall and her head just cleared the top of the pan. I remember her stirring and stirring the thick polenta in her beat up polenta pan. The pan looked like someone had taken a bat to it and beaten it until it wasn’t in its original shape. But mamma believed it was that pan that made her polenta so good. We believe it makes making all polenta much easier by adding the polenta to the liquid before it is hot. We have been using this method for a long time and our polenta has never been lumpy nor have we had a difficult time of the polenta seizing up too fast. How we make polenta gives the coarse grains time to cook but still remain chewy. Once the polenta is cooked we mound the polenta in a pan and spread it out in an even layer. Once it is cooled we cut it into squares and brush it with melted butter. We made it in a cast iron grill pan inside but it would also work on an outdoor grill or an indoor broiler — just so it is lightly toasted. 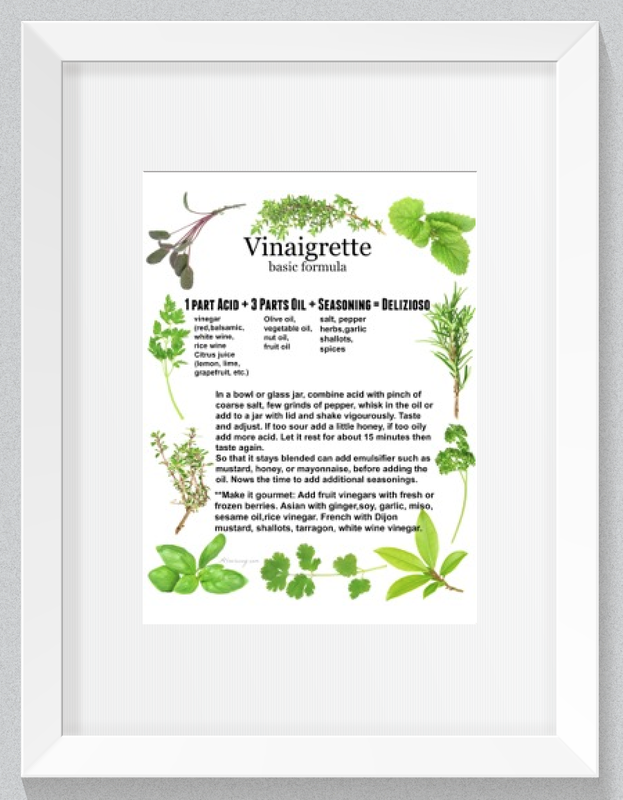 Use this as a master recipe and add your preferred herbs and spices — make it your way. Polenta is amazing — it can be served at breakfast, lunch, or dinner. Use polenta instead of mashed potatoes – squisito (scrumptious)! 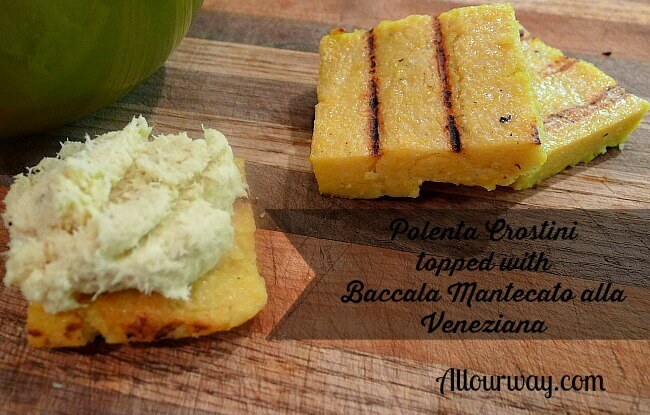 A master recipe for making grilled polenta crostini. It makes a delicious base for your favorite toppings as well as hundreds of others. In a medium size heavy saucepan, with a whisk combine the stock, milk, salt and polenta and bring the mixture to a boil stirring frequently. Reduce the heat to low. Switch to a wooden spoon or paddle and continue to stir every 1 or 2 minutes for about 20 minutes, or until the mixture comes away from the side of the pan and the grains of polenta begin to soften. The mixture will be very thick and the spoon will be able to stand in it for a few seconds. Add 2 Tablespoons of butter, Parmesan and freshly ground black pepper, stirring until they are thoroughly mixed in. Spray an 8 X 12 pan with vegetable spray. Mound the polenta in the pan and then using a spatula spread the polenta out into an even layer. You may have to dip the spatula into hot water so that it does not stick to the polenta. Cover with a towel -- do not use plastic wrap because it will sweat. Let the polenta rest at room temperature until cool. Put in the refrigerator to chill. When ready to serve preheat an indoor broiler or an outdoor grill to high heat. Melt the remaining 2 Tablespoons butter. Cut the polenta into squares and brush with melted butter. Grill about 3 inches from heat for 4 minutes on each side, or until lightly toasted. Remove from heat, and put on cooling rack. Serve with desired topping. Inspired by Brigit Legere Binns "Polenta"
Note: Recipes and content from All Our Way©2014 is copyright protected. Please do not use content or recipe without prior written permission. If you want to share the information please link to this post. Thank you. Oh man I love polenta in any shape or form, we actually did some grilled in the fall to go with a chili bar! Such a rustically simple dish to make and everyone always loves it. I love polenta but I never usually make cakes. We are so used to the creamy version. I must try this. I love how simple and easy you always make the recipes look Marisa. I love polenta but my cakes always fall apart. I chill it overnight. Any tips to get my cakes to stay together? I love polenta. One of my favorite foods actually. But I must admit that I have not tried them grilled. Very interested in trying it. Looks great. This polenta crostini look so inviting! I love grilled polenta and I make it often. I am so glad that I have the same method of making polenta: I also add the polenta to the liquid before it is hot. It really works! The grill looks great on this polenta! I bet the flavors are hearty and make an excellent start to a meal! This looks so good, Marisa!! I love the gorgeous grill marks on the polenta crostini. I bet they add a wonderful flavor, too! I love polenta and want to find ways to cook with it more often. This looks like a great start! 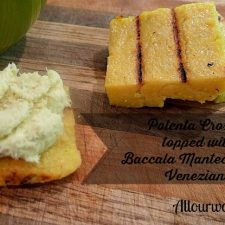 I have never had polenta crostini, but I am going to try it a.s.a.p.! This is so creative and looks very tasty. 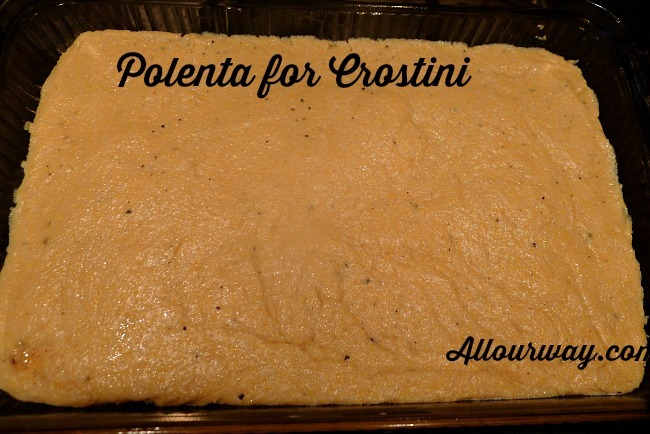 I loved polenta growing up as a child grandma made it all the time with sauce and sausage but this is such a great delicious idea how I cant wait to try this and they are perfect for dipping too! Oh, this looks wonderful, and the recipe seems so much easier than the constant stirring, and mashing the lumps out! Thanks!